The commercial property market has been particularly buoyant since the economic recovery began around the beginning of 2012, with over €20 billion worth of investment property transacting in that seven-year period. This compares with less than €9 billion transacting in the seven years preceding this. The Irish investment market had traditionally been driven by commercial assets offering verifiable tenant covenants and long lease terms. However, the market is now modifying itself to meet Ireland’s current socio-economic needs. A new sector is emerging and quickly becoming a driving force in Ireland’s investment property market. 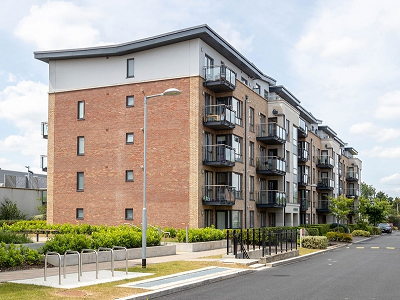 The multi-family sector, also known as the private rental sector (PRS), was relatively unheard of during the Celtic Tiger and throughout the downturn that followed. From the beginning of 2005 to the end of 2011, there were no investment sales recorded with an income stream solely reliant on residential tenancies. That said, it is important to note that the market across all sectors from 2008 to 2011 was stagnant, with a total transactional value of about €1.3 billion for the four years combined. To give some context, in 2018, there was more than €1.1 billion of multi-family transactions alone, accounting for almost one-third of the entire market. This made multi-family the second most dominant sector in the market, surpassed only by offices, which accounted for about 40 per cent of the market with €1.45 billion in transactions. The multi-family spend of over €1.1 billion was split across 36 transactions, giving an average deal size of over €30 million; 24 of the 36 deals were properties in Co Dublin, accounting for over 80 per cent of the total transactional value (€930 million). Interestingly, over 25 per cent by value of the Dublin market is attributed to two forward-funded deals, meaning the units have not yet been built, namely Fernbank in Dublin 14 and 6 Hanover Quay in Dublin 2. The most notable deal outside Dublin was the sale of the Elysian Building in Cork to Kennedy Wilson for a figure reported to be in excess of €90 million. Traditionally in Ireland, institutions and professional investors did not actively invest in residential property as it offered less certainty than its commercial counterpart and was not considered an institutional grade asset class. There was also a perception that being a residential landlord was labour-intensive due to the rolling annual lease agreements and varying irrecoverable costs. Recently, tighter regulations have served as a disincentive to private residential investment, with many smaller landlords leaving the market altogether. Conversely, many institutional landlords are entering the market. The implications of these regulations are less onerous to landlords that are incorporated and have significant scale in their portfolio. Also, the current rate of stamp duty is 2 per cent for residential properties over €1 million, as opposed to 6 per cent on commercial transactions; lower transaction costs have made multi-family investments more liquid in comparison to their commercial equivalent since the commercial level increased in 2017. Residential investments offer a greater spread of risk in terms of exposure to a wider number of tenants across multiple tenancies, rather than a smaller number of lease expiry dates with exposure to a few tenants who may or may not renew their leases. Between the census counts in 2006 and 2016 Ireland’s population increased by 12.3 per cent, but the number of residential units built during this time dropped considerably. In the five years up to the end of 2008, there were just over 66,000 residential units begun in Dublin. A decade on, the five years up to the end of 2018 had just over 25,000. Simply put, the number of new residential units provided in Dublin dropped by over 60 per cent at a time when the city was becoming more attractive internationally, unemployment was dropping and the population was increasing. So, supply is not meeting demand. These factors, in conjunction with the millennial generation’s openness to long-term renting, have meant national and international institutional investors have become more comfortable in the residential market. The draw to this sector derives from the lack of residential accommodation in Dublin city. With ten-year government bond yields at 0.92 per cent (as of January 25) the yield gap between multi-family returns and the alternative capital asset classes is seen as attractive for investors. The increase in values has been catalysed by unprecedented rental increases driven by the lack of supply, coupled with competitive bidding processes which have compressed the market yields. There is the potential for adjustment in our residential rental market at present, with several factors which could change in the short to medium term. Further government intervention in the residential rental market is likely, with the proposed Residential Tenancies (Amendment) Bill 2018 currently making its way through the Oireachtas. There have also been suggestions that landlords may be restricted in their ability to use Airbnb, which currently offers about 10,000 rentals in Dublin alone (insideairbnb.com); having these bed spaces or units re-released on more usual 12-month terms could reduce pressure in the market. By way of comparison, daft.ie currently offers about 1,400 rentals in Co Dublin. The current strength and buoyancy of the residential market is well founded and legitimate. The flexibility and comfort which comes from the ability to ‘break up’ the asset, coupled with increasing population, disposable income and rent levels, have resulted in Ireland, particularly Dublin, being one of the most attractive locations in the world for investing in residential property at a large scale.